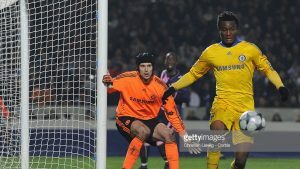 Super Eagles captain Mikel Obi has praised his former Chelsea teammate Petr Cech who announced his retirement on Tuesday, January 16. Mikel and Cech were teammates at Chelsea for nine years from 2006-2015 and were both influential in their team’s successes. Both Mikel and Cech were at Stamford Bridge during atrophy laden spell winning several trophies together. The 40-year-old Cech shocked the world as he announced his retirement with several high profile players and former teammates leading plaudits for Cech. The Nigerian skipper took to his official Instagram account to celebrate Cech with a picture of both of them and a message. Cech made 333 appearances for Chelsea before he left Chelsea in 2015 and Mikel for London rivals Arsenal where he has made over 100 appearances. Mikel left Premier League giants Chelsea in 2017 two years after Cech’s departure but they won two Premier League titles, four FA Cup, two Football League Cup, one FA Community Shield, UEFA Champions League and UEFA Europa League together.